We all need to tell the time – and worse still, wake up at a specific time. Power supplies for digital clocks are fighting over USB chargers for that last remaining wall socket. The Sandman Clock scores points for practicality by being an easy-to-see alarm clock, while providing four USB ports for charging. Let’s check it out. One of my favorite parts of CES is walking around the Sands convention center and talking with all the smaller companies there to show off their – what often turn out to be – inventions. Far removed from the commotion of the LVCC, with its Samsung and Sony sized booths, are companies either just starting out or too small to justify the cost of floor space on the bigger stage. It was on one of our laps around the second floor of the Sands that Rob and I ran into a couple of gentlemen eager to show off their latest product. The Sandman Clock is the first product out of the three-man team of engineers that make up PAI – Palo Alto Innovation. They brought the clock to CES to speak with anyone who was interested in hearing about its features, and once they told us about the Sandman Clock, they gave us one to take back with us, only asking for our input after using it for a while. This isn’t a rare thing at CES. Members of the press often come home with a bag or two of free gear, most of it going unused, but sometimes we find something useful. With just over two weeks between us and the end of CES, the universally understood unit of time called “a while”, we’d like to take a closer look at the Sandman Clock. The clock itself is somewhat unassuming. Its brick-like design doesn’t stand out and as a result, it should fit into most any home décor. The Sandman is almost a perfect rectangle, with rounded corners, but with the bottom center raised slightly higher than that of the sides. This was designed on purpose to allow cabling to be run and organized under the clock. Whether it’s a charging cable for your phone or tablet, or one for your NVIDIA Shield, the cables can be organized by running them underneath the Sandman. 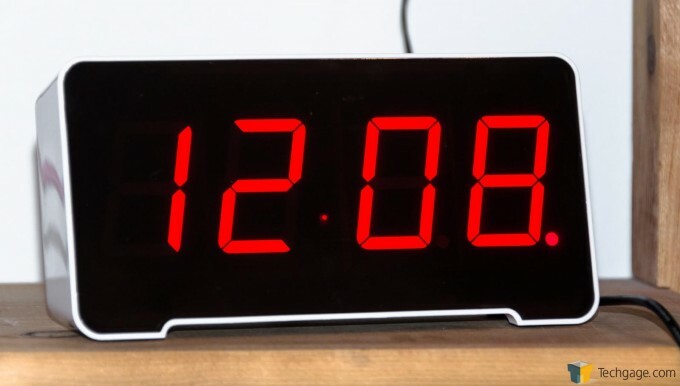 When powered on, the numbers on the face of the clock are 1.8 inches high, providing a clear and easy to read time. Looking at the back of the Sandman, we start to see what truly sets it apart from many other similar devices on the market. Present are the standard features of any alarm clock. There are buttons to change the time, turn the alarm on or off, and on the top of clock, in a familiar location, is what I consider to be the most merciful feature on any alarm clock: the snooze button. 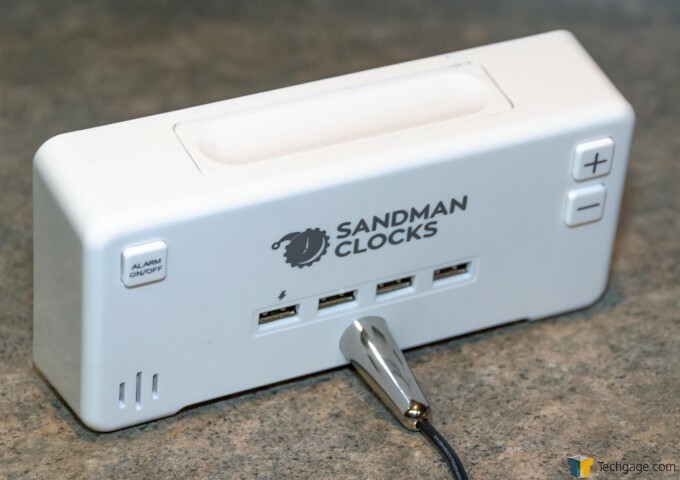 What makes the Sandman unique is four USB ports that run horizontally along the back of the clock. 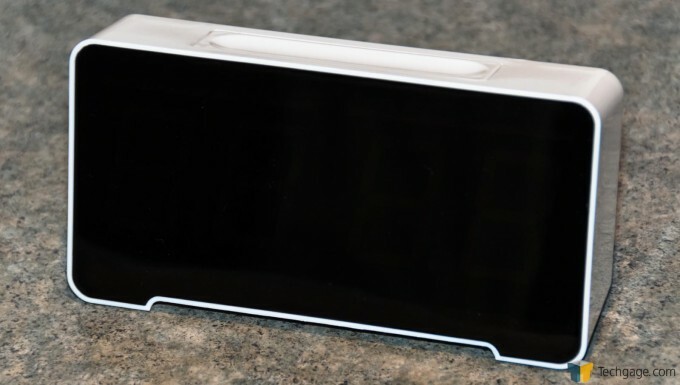 The first one is a high-powered port, designed to charge devices that need a higher amperage, like an iPad. The remaining three are standard ports that are intended to charge phones, fitness trackers, watches, etc. Whatever a PC or USB wall outlet can handle, so can the Sandman. Powering the Sandman Clock is something that should look familiar to most people. Instead of placing the power supply inside of the clock, a power brick has been opted for, instead. I can only assume this was done to keep the price of the clock to a level that the team at PAI deemed adequate (more on that in a bit… hint, it’s $35 shipped). One nice thing about the power brick is that it uses a standard 5-15 to C13 power cord… a standard PC power cable. This, again, was likely chosen to keep the price of the Sandman down. When powered on, the numbers are large and easy to read from any realistic distance in the home. One nice thing about the Sandman is that the brightness is adjustable. By holding down the snooze button and pressing either the plus or minus button on the back, the brightness of the numbers can be raised or lowered to a level found acceptable. If you’re cool with letting Sandman handle the dimming for you, it will adjust itself automatically depending on whether the lights are on or off. On the bottom of the clock is a clear set of instructions on how to use the Sandman. From changing the brightness to setting an alarm, every possible function of the clock is outlined on the device itself. This is what I love about CES. It’s neat to see the upcoming year’s latest tech, but it’s the small companies that get me excited. Perhaps it’s the three startups I’ve worked at over the years that lets me understand the hunger and drive that fuel these companies. Perhaps I just like new and affordable toys. Whatever it is, PAI has a winner with the Sandman. It’s not going to change the world, or the way we sleep, but it does take a device that every household has, and combines it with a feature that every household requires. You might have your alarm on your phone – I do – but when I want to know what time it is while I’m lying in bed, I certainly don’t want to take the time to pick up my phone. I just look at the clock. 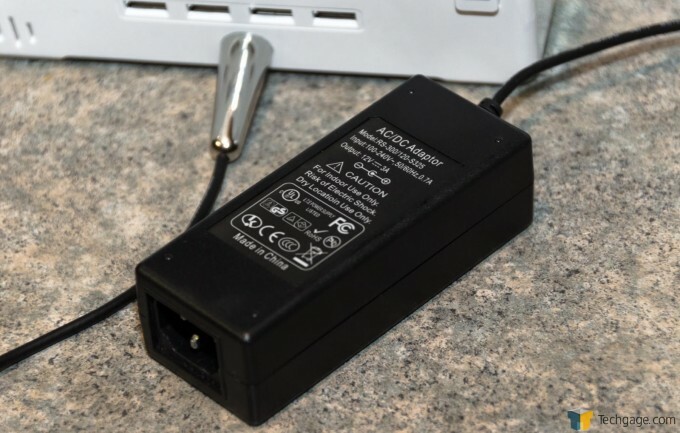 By combining powered USB ports, the first to provide four, Sandman lets me remove another cord in the wall near my bed by allowing me to charge by plugging directly into the clock itself. Available now for pre-order in white or black, the Sandman can be yours for $35 shipped.